I have only been able to trace my maternal ancestors back to my great-great-grandmother, Amelia Buckmaster, who was born in 1809 in Hounslow, Middlesex, England and who died in 1892 in Wallingford, Berkshire, England. I recently had my mitochondrial DNA tested (see an earlier post for more on mtDNA) and the results indicated that my mtDNA haplogroup is U. I did some research on the specific mutations identified in my mtDNA and identified my subgroup more specifically as U5a1a1.This means that I now know quite a lot about specific maternal ancestors and where and when they lived, all the way back to Mitochondrial Eve who lived in Africa 192,400 years ago. Subgroup U5 is the oldest of the seven native European haplogroups. Haplogroup U most likely arose in the Near East, and spread into Europe in a very early expansion, giving rise to seven native European haplogroups, including U5. The presence of haplogroup U5 in Europe pre-dates the last ice age and the expansion of agriculture in Europe. Today, about 11% of modern Europeans are the direct maternal descendants of the founder U5 woman. They come from all parts of Europe, but are particularly well represented in western Britain and Scandinavia. It is possible to trace the migration routes of the humans who left Africa and colonized the rest of the world by observing the distributions of the various mtDNA haplogroups, and knowing which haplogroups branched from others. Mitochondrial DNA in humans of African origin show the most diversity in the world. This supports the concept that ancient humans first existed in Africa, and stayed in Africa for thousands of years. Mitochondrial Eve’s haplogroup (L1) gave rise to a second haplogroup (N) about 70,000 years ago, either just before or just after humans crossed the Red Sea from Africa to the Arabian Peninsular. The humans who left Africa around 70,000 years age took two major routes, to Asia (haplogroup M) and to Europe (haplogroup N). Haplogroup N in turn gave rise to haplogroup R in West Eurasia and then around 54,000 years ago to haplogroup U (the European haplogroup). My maternal ancestors (subgroup U5a1a1) were part of the populations that tracked the retreat of ice sheets from Europe at the end of the last ice age and re-colonized Britain about 12,000 years ago. The single founder mtDNA sequence at the root of each haplogroup was carried by just one woman, and the age of the haplogroup gives the time in the past when this specific woman lived. 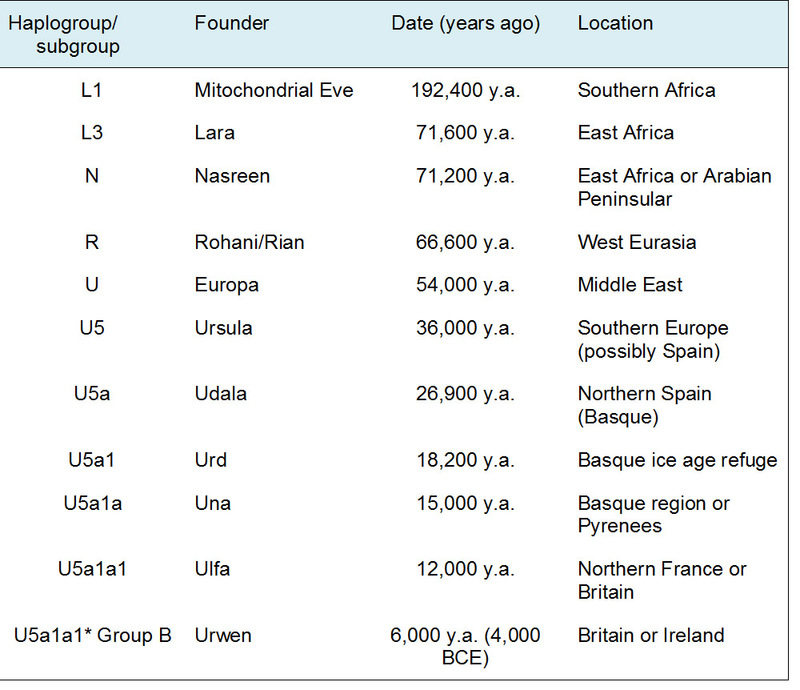 Bryan Sykes in his 2001 book The seven daughters of Eve gave names to each of the women who founded the seven native European haplogroups, and also names to some of their ancestral haplogroups. He chose names that began with the letter by which the haplogroup was identified. Oppenheimer (The Origins of the British: A Genetic Detective Story, 2006) followed this example and also gave names to both mtDNA and Y-DNA haplogroups. To emphasise that the maternal clan founders were real individuals, who were my ancesters, I have used these names and given my own names to the more recent subgroup founders. Using archaeological and other evidence, Sykes and others have reconstructed their imagined lives. In my next post, I will give a brief biography of each of these ancestral grandmothers, starting with Mitochondrial Eve, placing them in evolutionary, geographic, and climatic context. The chart below summarizes my deep ancestral grandmothers. This entry was posted in Deep ancestry and tagged ancestry, Genealogy, genetics, maternal ancestors by colinmathers. Bookmark the permalink. I had the National Geographic test my DNA and I am a U5, and so glad to be! I married a Basque blooded man and his children look very similar to the ones that run with the bulls. I wonder if that haplo-group gives them a tendency to like thrills, as I do. love of snow, that has to do with not only surviving the ice age, but sporting with it. Can’t you just see us hitching up those reindeer to a fast sled, and playing chicken on the rim of a mountain.. …laughing as we pack up our jerky that has finished freeze drying. Hi I am U5a but not sure what the sub number is beyond the a. Yes, excellent idea Colin. Will do! It will be very interestin to know, what the studies reveal. Thanks for the advice. I did not post that goofy green avitar! I live in the deep south but adore mountains and cold areas. My known majority ancestry is British and northern/western European with some ancient Greek & Russian. I, too am U5a1a1 haplogroup, and a bit of “edgemanship” seems to go with this. Comment? Also a U5a1a! Thanks for the great information. I am a U5a1a1 and live in Fl and hate the cold and do not have athletic abilities? I am also U5a1a1, nice article.